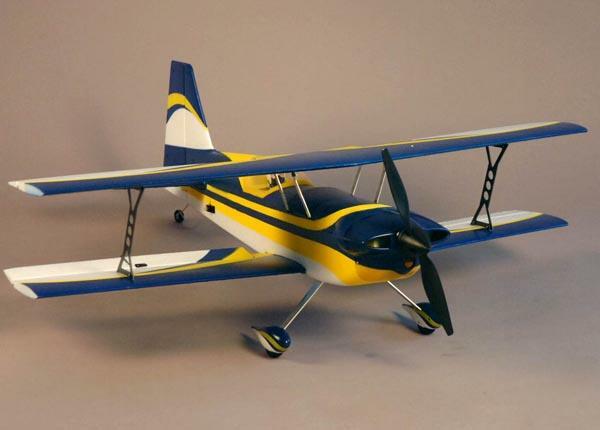 The Dynam Devil 3D is a 3D capable sport aerobatic biplane. The large wing area and light wing loading of a biplane construction offers extremely smooth and agile flight characteristics while demonstrating precise response and feedback from the controls. This biplane is designed around a 650kv brushless outrunner motor that will provide plenty of torque and power for any type of aerobatic maneuver. The 50 amp electronic speed controller supports this motor through a 14.8v 2200mah lithium polymer battery. The rudder and elevator controls are delegated with robust 17 gram servos for authoritative control while the ailerons are controlled by two precise 9 gram servos. The tail wheel is steer able allowing for easy taxing around the runway. A removable battery hatch located behind the cowl provides quick and easy access for battery swaps. Intermediate to advanced pilots will be extremely pleased with this planes character and performance. The design and construction showcases a level of quality and performance known from Dynam RC. Pilots will appreciate the light and rigid construction of the EPO foam finished in a beautiful paint scheme. This Ready to Fly version comes with all the electronics installed. You will need to obtain a charger capable of 4 cell charging to get this plane in the air.